• Maintain robust and up-to-date firm and professional profiles on the WSG site. Sync information on your firm site with WSG’s site by implementing the WSG Import Module. • Share your latest firm news, articles and blog posts to the WSG site. Utilize RSS feeds to automate sharing. • Include the WSG logo, description and links on your firm’s website to promote your membership and the value it brings to the firm and clients. Visit the WSG Brand Guidelines to download logos and descriptions. • Develop a plan to ensure strategic engagement, visibility and relationship building by firm professionals through WSG meetings and events as well as practice, industry and association groups. This includes active engagement in the WSG Marketing and BD group! • Regularly track referrals and collaborations through the WSG Referral Tracker Tool, allowing you to track inbound and outbound Network referrals with one simple tool. • Ensure that key stakeholders, from firm leadership to practice area leaders to marketing and business development professionals, understand the benefits and opportunities of WSG membership and work to leverage them. • Communicate the value and benefits of your WSG membership to firm professionals. Ensure professionals across the firm understand how to access and utilize membership to better serve clients. • Communicate the value and benefits of your WSG membership to your clients. Tout what your membership means to them: immediate access to prospects, information and leading experts with a known record of superior quality service. 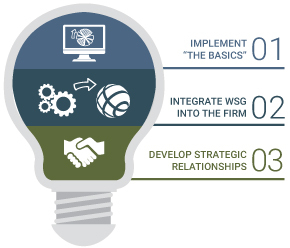 • Relationships within your firm to optimize firm activity and engagement across the WSG network. • Alliances based upon professional areas of practice, interests and participation in WSG groups (practice, industry and association). • Connecting with marketing/BD professionals across member firms to identify business opportunities and share knowledge. • Between firm and WSG marketing team to further discover and utilize the breadth and depth of the WSG Network. Membership is not “one size fits all” and WSG offers a wide variety of opportunities and resources, making it easy for firms to customize your membership. For more information and resources, we encourage you to visit the WSG Knowledge Center and view advantageous documents on the WSG Marketing Materials page. If you are not already in touch with a WSG Marketing staff member, reach out to [email protected] to discover more ways to optimize your firm’s membership.